Mark van Rijswijk is one the most allround producers on our label and really nice guy to work with. This time he is back with a new track on our Alltum label called Vista. An new side of him that most of you did not heard. Vista is really nice progressive house track which will be one of the perfect tracks to start your set with. 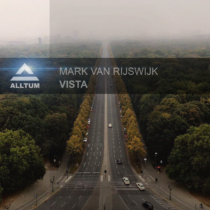 On the remix for Vista we have the extremely talented producer group from South Africa: Laminin Music and another fresh guy in the scene the dutch talent Wouter van Putten. Both deliver unique remixes to complete this great package for deephouse & techno lovers.